Imagine if you are a junior or senior on the USC Trojans. In 2013 you got off to an 0-2 start in the conference, and then head coach Lane Kiffin was fired at the airport. Ed Orgeron took over as interim coach, performed miracles to go 6-2 the rest of the way, but was given no chance to take over the team permanently. 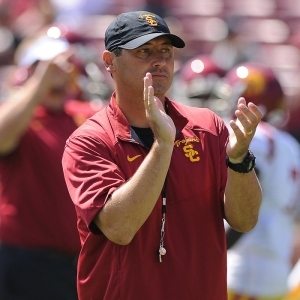 He was so frustrated he quit before the bowl game, and Clay Helton was the interim coach for that game. Then, they hired Steve Sarkisian - the definition of an underwhelming hire if there ever was one. Eighteen disappointing games later that ended really badly, and now the players are onto their fifth coach and third midseason interim takeover. Clay Helton is again the interim this time, and he has even less of a chance than Orgeron did of being the full-time man. Sarkisian wasn't good: I don't want to kick a guy when he was down, but the fact of that matter is that in six and a half seasons he has not shown he is capable of being a high-level college coach. His Washington teams were underwhelming and didn't improve - after going 4-5 in conference the first year he was 5-4 each of the next four years. He would not have gotten the chance to coach at USC given his record if he wasn't a Pete Carroll disciple. Then he came to the Trojans, disappointed last year at 9-4, and was well on his way to getting fired even if he was sober this year given the 3-2 start and lousy play. Simply, having to play without Sarkisian the rest of the way isn't a particular handicap because having him wasn't a particular advantage - and that's excluding that he allegedly wasn't always sober on the sidelines. The team has been through this before: This is a sad truth for these players. This can go either way. First, they could know that they can handle this because they have before, and they can rally. Or they could collapse because they are seeing their college careers wasted away by poor coaching and ridiculous drama. We don't truly know how this team is reacting, and we won't until we see them play. We also can't know if it helps that Helton is in charge. He has been with the team since 2010, so he has had a ringside seat to all of this. He could be a breath of fresh air for the team, or they could just view him as another part of the problem. The one thing we know won't be entirely positive, though, is that as head man Helton will be taken away at least somewhat from his roles as offensive coordinator and quarterback coach. That can't help. The talent is crazy: At the heart of it, this is a loaded team - much better than they have been playing. If Helton can get them to get out of their own ways and focus on what matters then they are capable of beating anyone. They have an excellent QB in Cody Kessler - albeit one who will have to deal in a shift in his QB coach - and plenty of other tools on both sides of the ball. The betting public doesn't care that much: The line in USC's weekend at Notre Dame opened at most spots with the Irish favored by 4. Now it has swung so that Notre Dame is favored by 6.5 or 7. A swing of a field goal or so isn't insignificant by any means, but it also isn't a sign of massive panic. The reality is that bettors largely didn't think the Trojans could win before the game, and they still don't. Barring some sort of major development going forward, that sentiment is likely to be stable for at least a while. Haden is still in charge: Pat Haden is still the Athletic Director at USC, and all indications are that he will remain there and will be the one to hire the next coach. If we have learned anything it's that that isn't a great idea. He wasn't the one who hired Kiffin, but he did keep him around too long and then botched his dismissal. Then he bungled the Orgeron situation, chose Sarkisian, and let Sarkisian's preseason drunken antics slide. It's hard to have a lot of faith in Haden from where I'm sitting, so it is very likely harder to do so when you are sitting in the clubhouse. The schedule is rough: Going to Notre Dame now isn't ideal. Then they host a very good Utah team. Then a trip to Cal and their very challenging offense. Arizona isn't great this year, but they still always have a way of getting up for big games. Colorado isn't as bad as they have been, and Oregon is struggling but still dangerous - especially when they are at home as they will be against USC. Finally, they close against cross-town rival UCLA. If things get off to a rocky start for the Trojans and their faith in their new reality is shaken then things could get really ugly.